If you're looking to make some new friends, this is the place. Decked out with a funky kitchen and a huge common room, you're guaranteed to find some sociable travellers to hang out with. Once you've met your new buddies, most of the main attractions in Guadalajara are within a 5 minute walk from the hostel, so there'll be plenty for you to do. The Instituto Cultural Cabanas and the Expiatory Temple are both close by, and the hostel staff will be happy to help you arrange anything that that involves venturing outside of the city. Our FREE features include: Wi-Fi & computers with internet access, Hostel activities (pub crawl, walking tours in downtown, etc. ), continental breakfast, bikes, bed linen & towels, daily cleaning service, city maps. Our facilities include clean, bright, airy private rooms with private bathroom, private rooms with shared bathroom, and 8-bed dorms (mixed and female) with balcony and high ceilings, massive lockers, hot showers 24 hrs. a day, laundry facilities, living room with pool table, lounge chairs & hammocks, TV w/cable & Netflix, spacious fully-equipped kitchen, affordable daily tours to Tequila & Chapala Lake. Lonely Planet, the world's most trusted travel guide says about us: “This downtown option is popular with a young crowd looking for a good time…” We are your reliable choice in Guadalajara and offer you the best price-value in town! Owned and managed by travelers at Hospedarte Centro Hostel we encourage our guests to mingle and have a great time & make this one of the most memorable places on your travels! So stay with us and see why Hospedarte Hostels are the most popular and lively hostels in Guadalajara! The place was great! Guadalajara was great! Would have been handy to have a better storage system for people's bags pre or post checkout, but it worked! This place is SO GREAT! Really feels like home away from home, and in my opinion, had the best balance of meeting people, hanging out at the hostel bar, and being able to go to sleep at night (due to quiet hour at midnight). Location is perfect, rooms are clean, staff is BEYOND AMAZING. I absolutely cannot recommend this place enough. Hospedarte Centro was such a nice hub and relaxation point between seeing all the sights Guadalajara has to offer. They allowed me to check in a day early after a mishap with hostelword which was awesome. Their friendly staff game me tons of recommendations when I was feelin like trying something new, and they seem to offer something almost every day. I love, love, love that they had free bikes to rent as Guadalajara is very bike friendly. This was an excellent hostel! The staff were all very helpful and knowledgeable. Everything was kept very clean. Its location to the historic center is perfect and great for visiting that part of town. 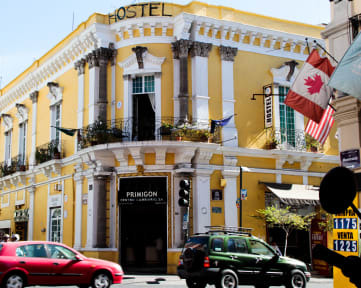 I would recommend staying a couple nights at the centro location for the historical things and then a couple in the Chapultepec sister hostel for the nightlife. The Saturday morning walking tour with Michelle was amazing, he was an excellent tour guide. This is one of the best hostels I have ever stayed at. The location is incredible. Guadalajara is a fantastic city with so much to offer. The location of this hostel made it so easy to get around and see everything. The room was clean, the atmosphere was great, and everything was excellent. I will stay here again next time I’m in GDL! Showers were hot. Bathrooms were mostly clean. Common room was a nice place to hangout. The dorms have lockers, backpack size and passport/wallet size for each bed. There are several patios, and the hostel itself is in a cool old building. Hostel Hospedarte gave me fantastic experience during my stay in Guadalajara. Everything was very clean. The hostel offers free activities throughout the week for travelers. I attended the Tequila night and the Museum tour. Both events were fun and memorable, the guides were outgoing and helpful at all times, for that thank you, Checo, and to the lady who gives the museum tours on Tuesdays. Also, big shoutout to Alex the evening staff for all his help. A suggestion, breakfast can easily improve. Great place with super friendly staff. I only complaint is that the common room area furniture is run down. Otherwise a great value. I would stay here again. Great location, friendly staff, and good breakfast. Only downside is there was a mosquito problem making it a bit hard to sleep at night. If you\'re looking to make some new friends, this is the place. Decked out with a funky kitchen and a huge common room, you\'re guaranteed to find some sociable travellers to hang out with. Once you\'ve met your new buddies, most of the main attractions in Guadalajara are within a 5 minute walk from the hostel, so there\'ll be plenty for you to do. The Instituto Cultural Cabanas and the Expiatory Temple are both close by, and the hostel staff will be happy to help you arrange anything that that involves venturing outside of the city.